Donald Trump Jr. Had Direct Contact With WikiLeaks During Campaign : The Two-Way President Trump's eldest son acknowledges that he exchanged direct messages via Twitter with WikiLeaks before and after the release of hacked emails from Clinton campaign chairman John Podesta. Donald Trump Jr. is interviewed by host Sean Hannity on the Fox News Channel television program, in New York in July 11, 2017. The Atlantic, The Wall Street Journal and The Washington Post, in articles published late Monday, said that then-candidate Donald Trump's eldest son used the messaging feature on Twitter to communicate with WikiLeaks, which in turn alerted the campaign to the impending release of the hacked emails. 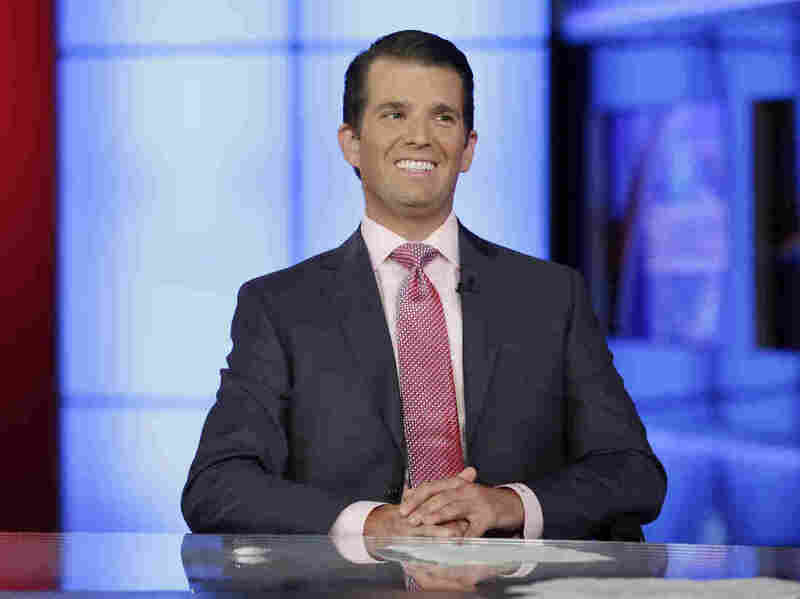 The publications report that the messages between Trump Jr. and WikiLeaks were among thousands of documents turned over to Congress as part of its ongoing investigation into claims that Russia interfered in the November election — a finding backed unanimously by U.S. intelligence agencies, which have said that the Kremlin aimed to aid Donald Trump's campaign. WikiLeaks was founded by Australian computer programmer Julian Assange, who rose to global prominence in 2010 when he published damning classified information from Chelsea Manning, the former Army intelligence analyst then known as Bradley Manning, and video from the Afghanistan war. Since 2012, Assange has been seeking asylum in the Ecuadorian embassy in London, in an effort to avoided an arrest warrant in Sweden on sexual assault charges. Those charges were dropped earlier this year. U.S. intelligence agencies believe WikiLeaks served as a conduit for Russian efforts to sway the election through the release of hacked emails. An intelligence assessment put out in January concluded "with high confidence" that the GRU, Russia's foreign intelligence agency, "relayed material it acquired from the [Democratic National Committee] and senior Democratic officials to WikiLeaks." The Atlantic reports that in its communications with Trump Jr., WikiLeaks "made a series of increasingly bold requests," which included "urging the Trump campaign on Election Day to reject the results of the election as rigged, and requesting that the president-elect tell Australia to appoint [Assange] ambassador to the United States." That back-and-forth — or at least a portion of it — was released in a tweet by Trump Jr. on Monday. The first direct contact appears to date from Sept. 20, 2016, when a message sent from WikiLeaks' Twitter account to Trump Jr. tips him off about the launch of an anti-Trump website, putintrump.org. Trump Jr. responds: "Off the record, I don't know who that is, but I'll ask around." On Oct. 3, WikiLeaks, writing a day before it was set to announce the release of hacked Democratic emails, wrote to Trump Jr.: "Hiya. It'd be great if you guys could comment on /push this story." To which Trump Jr. replies: "Already did that earlier today. It's amazing what she can get away with," in apparent reference to Hillary Clinton. Trump Jr. then sends a message asking: "What's behind this Wednesday leak I keep reading about?" It wasn't until Oct. 12 that he got a response: "Hey Donald, great to see you and your dad talking about our publications." "Strongly suggest your dad tweets this link if he mentions us," it went on to say, adding a link to hacked emails from Clinton campaign chairman John Podesta. Fifteen minutes later, candidate Trump tweeted: "Very little pick-up by the dishonest media of incredible information provided by WikiLeaks. So dishonest! Rigged system!" "Leak us one or more of your father's tax returns," the message suggests, "Most of the harm has already been done by the nyt [New York Times] and pre-empted by your father (tax writedowns)." "If we publish them it will dramatically improve the perception of our impartiality," the message continues. "That means that the vast amount of stuff that we are publishing about Clinton will have much higher impact, because it won't be perceived as coming from a 'pro-Trump' 'pro-Russian' source, which the Clinton campaign is constantly slandering us with." Trump Jr. does not appear to have responded to the request. On Oct. 14, weeks after Trump Jr. began communicating with WikiLeaks, then vice presidential running mate Mike Pence went on Fox News to deny allegations that the campaign was "in cahoots" with WikiLeaks, saying: "Nothing could be further from the truth." The vice president's office on Monday said he "was never aware" of contacts between the campaign and WikiLeaks. White House lawyer, Ty Cobb declined on Monday to comment on the latest reports, referring instead to Trump Jr.'s attorney, Alan Futerfas. "All sides in this campaign, the Clinton side, the Trump side, were monitoring WikiLeaks to see what they would publish next," Futerfas said, according to the Post. "If The Washington Post or the New York Times was looking to see what was being released, does that suggest any impropriety on their part? Of course not." Assange tweeted Monday that he cannot confirm the alleged direct messages with the Trump campaign because WikiLeaks "does not keep such records" and asserted that "the Atlantic's presentation is edited and clearly does not have the full context." The messages between WikiLeaks and the Trump campaign come months after revelations that Trump Jr. exchanged emails with Kremlin-linked lawyer Natalia Veselnitskaya and met with her in Trump Tower seeking "dirt" on Clinton. And, as The Atlantic notes: "The messages exchanged with WikiLeaks add a second instance in which Trump Jr. appears eager to obtain damaging information about Hillary Clinton, despite its provenance." A previous version of this story incorrectly stated that WikiLeaks published classified information about Chelsea Manning. Actually, the information was provided by Manning, who was then an Army intelligence analyst known as Bradley Manning.